The best in hearing loss treatment and audiological care. A family-friendly staff of licensed hearing specialists. Make informed decisions on the purchase of your next hearing device with our guide. Dr. McEachern has earned the highest educational degree in her profession, Doctor of Audiology. Dr. McEachern has had special training in the identification, assessment, prevention, and treatment of hearing conditions. Dr. McEachern’s practice offers a wide range of evaluation measures to best explain an individual’s unique hearing condition. She offers comprehensive discussions with patients and their families on management of the hearing loss. Dr. McEachern had dedicated her professional career to helping others hear better. She has served the hearing needs of Lincoln County for over 30 years. She has helped thousands of hearing impaired people and their families. Dr. McEachern and her staff are passionate about healthy hearing. Our audiology and hearing aid center is staffed with caring, compassionate professionals who are dedicated to our patients. We listen so you can hear, and we are here to help you hear! 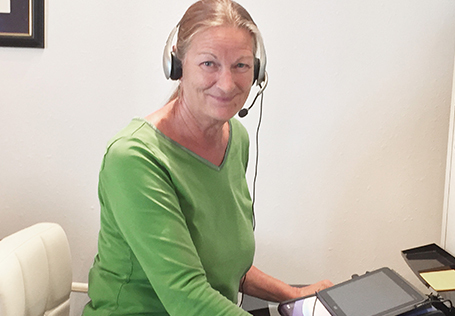 We are committed to providing you with the ability to hear through advanced testing methods, effective treatment options, and the best in hearing aid technologies. We have access to a wide range of hearing instruments from the top manufacturers. We are able to offer basic, advanced and premium level products. We also carry assistive listening devices, including personal amplifiers, TV listening systems and special telephones for the hearing impaired. We have these products available for your demonstration and use. I so appreciate all of you! Thank you for the outstanding services I have received! G.H. People First is Oticon's promise to empower people to communicate freely, interact naturally and participate actively. Phonak's goal is to improve the quality of life of people with hearing loss. Phonak is the innovative force in hearing acoustics. Starkey Hearing technologies believes being able to hear the world and the people around us is as essential to the human experience as breathing. ReSound provides excellent sound by offering innovative hearing solutions that combine original thinking and design with solid technology. Unitron delivers an exceptional customer experience based on renowned personal service and create products that make a real difference in people’s lives.